Five card draw poker is one of the easiest forms of poker to learn and a valuable asset to add to your gaming arsenal. Although you are less likely to find this actually played in a brick and mortar casino, 5 card draw poker still has its fans and is a good stepping stone if you are new to the world of poker. In fact, 5 card draw poker is witnessing a resurgence through online play, with tournaments and games a considerable draw for virtual casinos. Here we run down the basics and offer some tips to turn you into a master player. The rules of 5 card draw poker are not too dissimilar from other forms of the game – the player aims to make the best five card hand. As such, the play should be simple enough, just bet corresponding to your hand. To make a long story short (for absolute beginners), a hand falls into one of several types: flush, straight or pair. In descending order, the best hand goes: royal flush, straight flush, four of a kind, full house, flush, straight, three of a kind, two pairs, pair, high card. Now that you know the very basics, lets talk about types of play. There are two principle ways of playing 5 card draw poker, ante or blinds. Ante is the most frequently played. With the ante method, each player pays an ante before they’re dealt their cards. The blinds method works like Texas Hold’em, with the two players on the left of the dealer paying before being dealt their cards. Via the blind method, the first player pays a small blind and the second paying the big blind. Once players have either anted or payed their blinds, they are dealt five cards face down. Upon being dealt, the first round hits off. If you play blinds, the next player to the left of the big blind makes their bet; if you are playing antes, the betting starts left of the dealer. 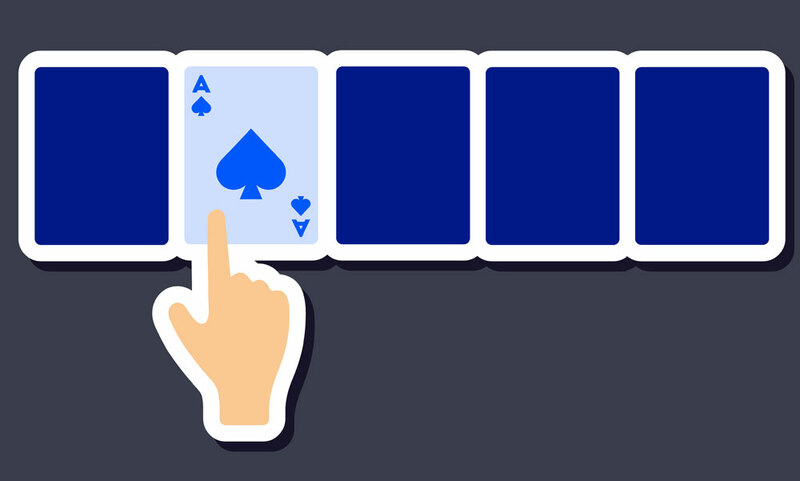 In a true ante game, the first player can check their hand (and not be forced to bet). After betting is finished, the draw round starts. Here, the player to the left of the dealer — as long as they don’t fold — has the option of changing any amount of their cards. Players can stand pat with their original cards, or they can discard anywhere between 1 or 5 cards for new ones (although some games set a maximum). The second run starts with all player evaluating their hand and making their final bets. Upon making your bet, it is time for a showdown. Upon completion of this game, the dealer often passes the cards to their left for the next round of play. Now that we know the rules of play, it’s time to look at the best ways to play. A top tip for players is to keep the pot raised despite your position. A pot should always be raised to prevent other players from limping behind and gaining a stronger hand. If you play from the outset with hands like aces or kings, then your position improves as you add queens, jacks, tens, and so on. As the saying goes “tight is right” in poker. In basic poker play, you should consider the following changes of hand: when holding one pair draw three other cards when holding two pair, draw one, and when holding three of a kind, draw two cards. Adhering to this simple rule in low stakes games will allow you to make gains in play. Now that you know the basics, try looking at practicing your play with low stakes online poker. You can start applying a more detailed online poker strategy once you become acquainted with the natural feel and rules of play. Remember, the basics are basic to most people, so following the card drawing rule may give away your hand. Conversely, 5 card draw poker often has far less room for bluffing as other forms of play. Some advanced strategies to pursue include taking mental (i.e. psychological) notes of the cards being played by your opponents; if a player opens with a pair of jacks or a greater hand, fold a pair of nines during the blinds instead of making a call. Although 5 card poker is not as popular as other forms of the game, there are many tournaments to choose from when you play poker online.